The Murcia and Costa Cálida region has one of the most agreeable climates in Spain, with temperatures averaging 21º C and around 320 days of sunshine every year. Murcia and the Costa Cálida have much to offer in the way of rest and relaxation, as well as the luxury of sunshine all year round. The 250km Costa Cálida Mediterranean coastline is lined with beautiful beaches consisting of soft white sand and wonderful little coves, giving the feeling of an undiscovered land seeped in history and heritage. 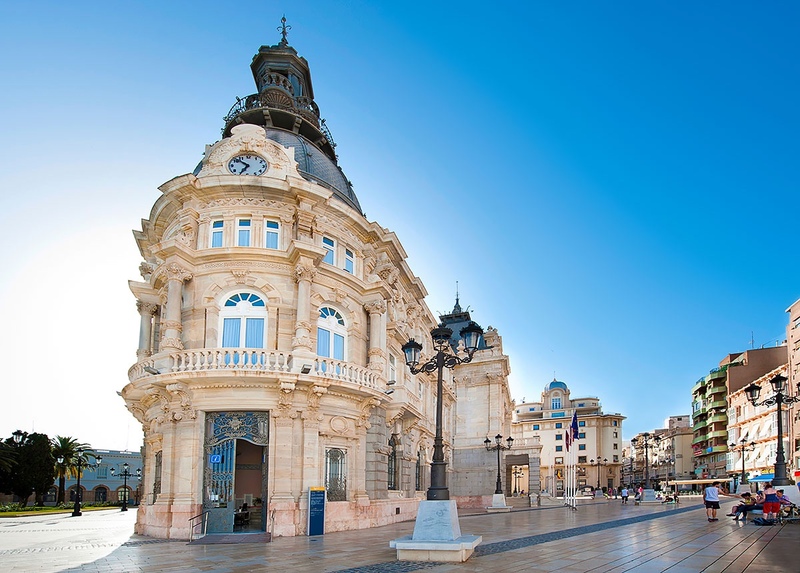 There’s plenty to see and do in Murcia and the Costa Cálida. Along with the vast water sport activities that are on offer, including fishing, water skiing and wind-surfing, there is the opportunity to sample some truly amazing local cuisine. For a glimpse of authentic Spanish urban life, take a 20-minute drive to Murcia, the bustling capital of the region. 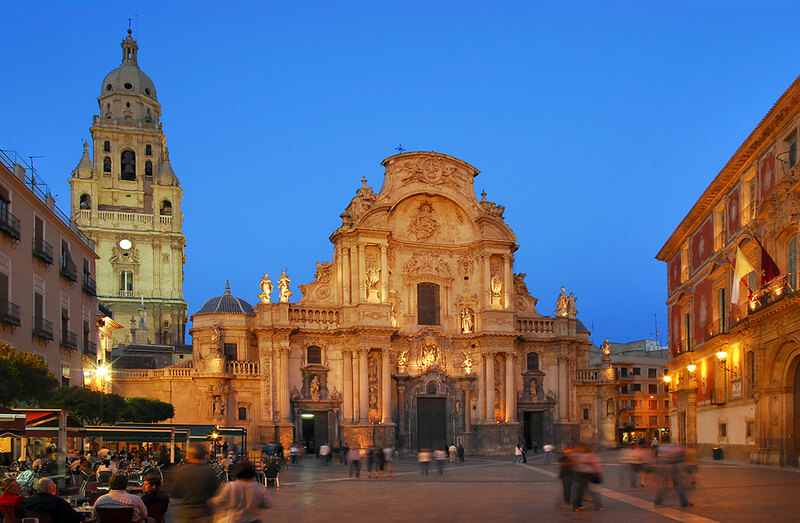 Murcia is full of interesting cultural and tourist places to visit. Its glorious cathedral is a powerful reminder of Spain’s rich history, while the region’s artistic and historic wealth is on display at the city’s numerous museums, such as the Archaeological Museum, the Fine Arts Museum or the Salzillo Museum. For less lofty desires, Murcia’s wide sunny avenues are lined with a great selection of both Spanish shops and familiar European high street names. Alternatively, around the backstreets towards the cathedral is a network of winding lanes brimming with exclusive little shops and charming boutiques. Just 25-minutes’ drive from La Torre Golf Resort is the historic port of Cartagena. Originally an important Roman port, it is now a busy cosmopolitan town. Founded in 220 BC, Cartagena is home to 12 museums, 4 impressive churches and a host of picturesque buildings. It has been inhabited by a number of great civilisations, including the Vandals, the Byzantines and the Moors. You can take a boat tour to see the ancient maritime sights, historic fort and hilltop castles. Amble around the town, taking in its numerous cultural and historic landmarks. Or just head to the shops: Cartagena offers a selection of typical Spanish shops and high street brands. Click here to view a tour of the Roman amphitheatre in Cartagena. If you are holidaying at La Torre Golf Resort, there are many beaches and surrounding towns to visit. All are easily accessible, but it is recommended that you hire a car to truly take in all that Murcia and the Costa Cálida has to offer. To help you, we’ve left a sat nav at the house, with a number of recommended restaurants, bars and beaches already programmed in. La Torre Golf Resort is a 20 minute drive from the safe, sandy beaches of the Mar Menor (‘Little Sea’), a warm natural lagoon sheltered from the main Mediterranean Sea by a long sand bank. Along the coastline of the Mar Menor and the Mediterranean you will find miles of golden sand, shallow waters and hidden coves, enough to try a different beach for every day of your holiday. Los Alcázares, on the Mar Menor, has some of the finest beaches on the Costa Cálida (‘The Warm Coast’). Several have won awards for their high standards. Along the promenade there are various bars, cafés and restaurants selling local tapas, along with play areas for children. A short walk inland is the centre of Los Alcázares town itself. Further along the Mar Menor are the fine sandy beaches at San Pedro del Pinatar. If you’ve had enough sand, try Las Charcas’ famous therapeutic mud baths, which are believed to prevent rheumatism and arthritis. Or there’s Santiago de la Ribera, whose wide, newly refurbished promenade leads on to a sandy beach, with many beachfront cafés and restaurants to sit and relax. You can also take a relaxing ferry trip from here across the Mar Menor to La Manga. For a little more seclusion, try the hidden gem of Torre de la Horadada, characterised by small private coves and warm clear waters.